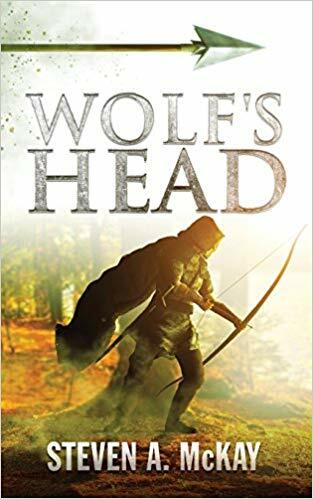 “Well researched and enjoyably written, Wolf’s Head is a fast-paced and original re-casting of a familiar legend. McKay’s gift as a storyteller pulls the reader into a world of violence, passion, injustice and revenge and leaves us wanting more!”Glyn Iliffe, author, The Adventures of Odysseus series.When a frightened young outlaw joins a gang of violent criminals their names – against a backdrop of death, dishonour, brotherhood, and love – will become legend.ENGLAND AD 1321 After viciously assaulting a corrupt but powerful clergyman Robin Hood flees the only home he has ever known in Wakefield, Yorkshire. Becoming a member of a notorious band of outlaws, Hood and his new companions – including John Little and Will Scaflock – hide out in the great forests of Barnsdale, fighting for their very existence as the law hunts them down like animals.When they are betrayed, and their harsh lives become even more unbearable, the band of friends seeks bloody vengeance. Meanwhile, the country is in turmoil, as many of the powerful lords strive to undermine King Edward II’s rule until, inevitably, rebellion becomes a reality and the increasingly deadly yeoman outlaw from Wakefield finds his fate bound up with that of a Hospitaller Knight…”Wolf’s Head” brings the brutality, injustice and intensity of medieval England vividly to life, and marks the beginning of a thrilling new historical fiction series in the style of Bernard Cornwell, Simon Scarrow and Anthony Riches.